We’re still driving towards the depths of winter here in New York, but I just noticed that our days are getting longer. Spring migration will be here before you know it, right? Frigid temps and icy conditions couldn’t keep me from chasing down at least one of the Red-Headed Woodpeckers hanging around Durand Eastman Park. Fortunately, I was able to spot one extremely quiet and still bird… I think it was frozen! Corey enjoyed leading a New York City Audubon bird walk at Forest Park on Saturday morning and visiting Breezy Point on Sunday. Though he had quite a few species to choose from his easy favorite was any of the many Razorbills he saw at Breezy Point. 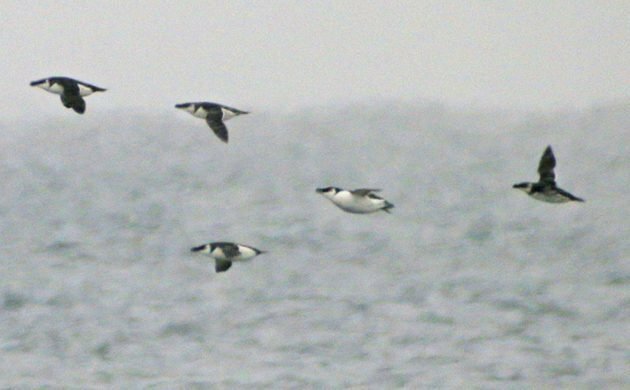 They have been around in numbers this year and to see more than 150 Razorbills in Queens was quite a treat! My best bird was a small flock of Dovekies in Montauk on Saturday. Sadly I didn’t stop on the way home to see the Murre’s at Shinnecock. Traveled to Madera Canyon, to see the Arizona State first ever White-throated Thrush. Still keeping busy then, Tom! Yeah…just not every day now! Thinking about an Arizona Big Year….but, please don’t tell my wife!